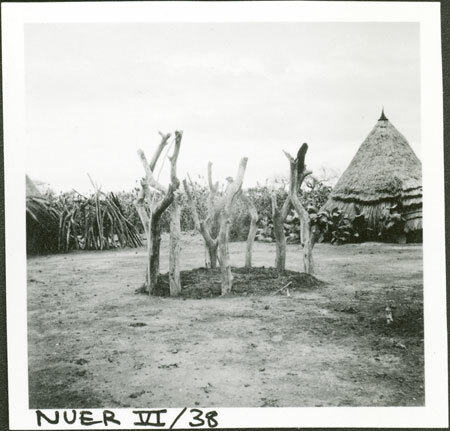 A cattle-dung fire surrounded by thick forked branches placed in the centre of the cattle pen in a homestead. Such fires or smudges were made to help keep away pests such as mosquitos from cattle during the rainy season, and sometimes during the dry season, by enveloping the kraal in thick smoke. Such fires, known as gol, were metaphorically associated with both the home, family and lineage, and the ash was rubbed on cattle before blessing or sacrifice. Note on print reverse ms pencil - "3" & print front border ms ink - "NUER VI/38"
Morton, Chris. "Nuer kraal fire" Southern Sudan Project (in development). 03 Jan. 2006. Pitt Rivers Museum. <http://southernsudan.prm.ox.ac.uk/details/1998.355.266.2/>.